Freeze a pork chop meal to enjoy later. When you have a hectic week or month coming up, you can prepare for dinner by making and freezing pork chop meals ahead of time. Make one or two dinners at a time for convenience and freeze them in individual packages. 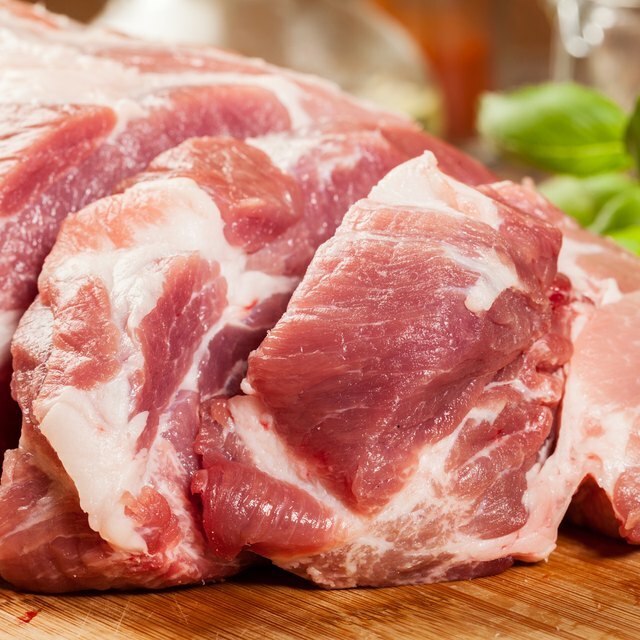 Freeze the meat at 0 degrees Fahrenheit or below to prevent the risk of food-borne illness. Pork chops and gravy is a classic meal ideal for nights when you're craving comfort food. Fry the pork chops in a skillet until their internal temperature reaches at least 145 degrees Fahrenheit when checked with an instant-read food thermometer. Smother the pork in a gravy made with pan drippings, buttermilk, flour, chicken broth and sauteed onions. Accompany the meal with mashed potatoes and steamed fresh vegetables. Package the meal in rigid plastic freezer storage containers with air-tight lids. Stuffed pork chops make a delicious and eye-pleasing entree for fancy dinner parties. Prepare the meat prior to a special event and freeze it until the big day. To make the dish, slice thick pork chops horizontally to create a pocket for stuffing. Spoon the stuffing of your choice into the chops and brown them in a skillet. Finish cooking the meat in the oven and place it in sturdy freezer storage containers before freezing. Creamy pork chop casserole is a satisfying one-dish meal. Use either bone-in or boneless chops to create the dish. Before making the casserole, coat the pork chops in flour or crushed croutons and pan-fry them for several minutes on each side to reduce the oven-baking time. Layer the pork chops with stuffing in a greased baking dish and pour a creamy mushroom gravy over the top. Customize the flavor of the dish by seasoning the gravy with dried herbs, such as rosemary and thyme. Freeze the meal in plastic storage containers. Marinating boneless pork chops in a mixture of fresh ginger, rice vinegar, soy sauce and sweet chili sauce will give the meat a spicy Asian-inspired flair. Place the pork chops and marinade in a large plastic freezer bag and allow the mixture to rest in your refrigerator for an hour. Grill or pan-fry the chops and place them in a plastic storage container with jasmine rice and steamed bok choy before freezing.